I am the type of person that likes to research an item before purchasing. Shopping online has really been great because I cannot only find the best bang for my buck, but I can also read what other people are saying about the particular item that I am looking for. This week, our food chopper died on us. We were using it everyday to chop up the babies food. I didn’t even realize until now how much I really need a food chopper until now, not having one. My husband and I went to Costco over the weekend and we saw that they had a food chopper there, but it was a larger sized one. The price wasn’t bad so my husband was trying to convince me that we should just buy it. But I tried to explain to him that I am not going to buy something just because the price is decent. I really needed to research it first and find one that totally fits my needs – size, color, quality, price, etc. So, today, I sat down and did a Google search on “Mini Food Chopper” and came up with a whole list of options. I checked Amazon, Shopping.com, and then wound up on Yahoo and that led me to iKitchen.com which had exactly what I wanted – the Cuisine Art Mini Chopper and guess what? It was on sale for HALF PRICE! Whenever I place any order online, I ALWAYS do a quick Google search for “coupon codes” under that specific company that I am ordering from. So for instance, this order from iKitchen, my search was “iKitchen.com Coupon Codes”. 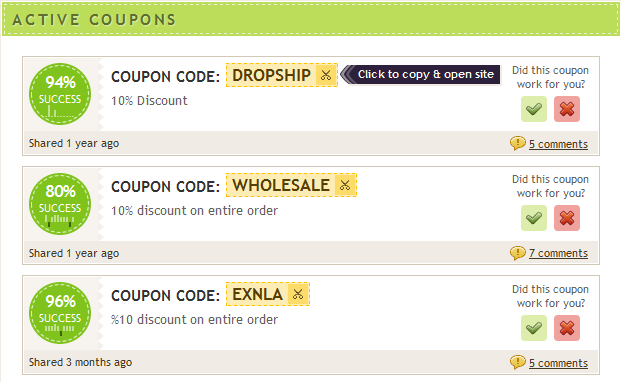 And from there a bunch of sites come up where you can look and see if there are any discount codes available to use. Sometimes you will find codes for free shipping, percentages off, free gifts, etc. I never order anything without trying to find a discount code first. I have to say that 75% of the time that I do order online, I find a coupon code. And this is a huge help because as we all know, every little bit counts! So, do any of you use coupon codes? .-= Mary Lutz´s last blog ..How to Avoid Becoming Overwhelmed as a WAHM =-.